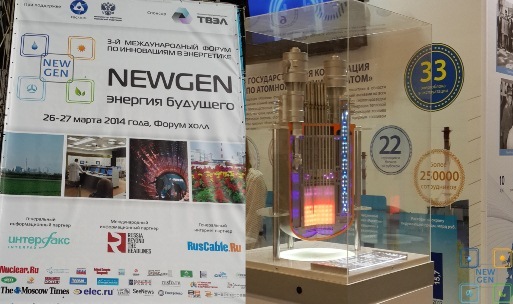 AKME-engineering took part in the III International Forum on Innovation in Energy "NewGen - Future Energy" which was held March 26-27 in Moscow. The forum was organized by the Center for Information and Exhibition activities Atomexpo with the support of the State Corporation Rosatom and the Ministry of Energy. NewGen is a business platform which reflects innovative development trends of the global energy industry. Main forum discussions affected such topics as innovative nuclear technologies, alternative and renewable energy, energy efficiency and resource conservation, small nuclear reactors development in Russia and abroad, and many others.